Not that I’ve ever gone to any trouble to deny it, but I can’t, for the life of me, sit through even 5 minutes of a zombie movie. Hell: I even put off watching Zombieland, a comedy. It’s never the zombie film itself that scares me. It’s more about what happens after. Each time I see a zombie on screen, I dream of zombies that night. And that’s the part I try to avoid. My zombie dreams are terrifying and rather difficult to get out of. The set-up tends to be the same. Whether I’m in the city or country, it’s down to me and maybe 1 or 2 other living people. We know the world’s been taken over by zombies, and we simply wait for them to close in on us. I’m either lucky enough to wake up just as they’re about to get us, or I have to endure becoming one of them. Just to be sure, in my dreams, there’s never a way out. No heroic Woody Harrelson figure bursts through my door wielding a bazooka. I usually don’t scream much either, not because I’m paralyzed but because what’s happening is inevitable and the only thing to do is wait. I’m trapped. End of. If I’m transformed into a zombie, I don’t suddenly scour the neighbourhood for non-dead brains. I just stop…being. I don’t do anything, really. I don’t move around or think things or want things. I am nothing. For a very long dream-time minute, until I wake up, my existence is nothing. Save the brain-chasing, that pretty much sums up your average zombie reality. They seldom, if ever, get characterized in movies, because you can’t give “nothing” a personality. Vampires? Werewolves? Man-eating monsters? They sometimes get the artistic treatment. But zombie stories tend to focus on the experience of the living rather than the thing that’s challenging their living experience. For many years, I’ve tried to figure out why I have a zombie phobia. Then recently, it dawned on me. I believe what scares me about zombie dreams is what’s scary about zombies in general: they are death itself. Zombies force us to deal with death. They even force us to look death square in the face: warts, decomposed flesh and all. Zombies differ from vampires, monsters and aliens in that we can’t assign them any sort of “otherness”: they’re us. Not now, but soon enough. And it’s a bleak future. They weren’t rescued by a forgiving god or a noble scientific process. They just laid there rotting in the ground until some unknown source animated their bodies. But they’re not sentient. They’re not really beings. They’re just piles of worthless flesh that we don’t even pity once they’re shot dead(er). If zombies took epidemic proportions, we probably wouldn’t have much of a chance against them. We’d all die, but not just because zombies would kill us or turn us into them. 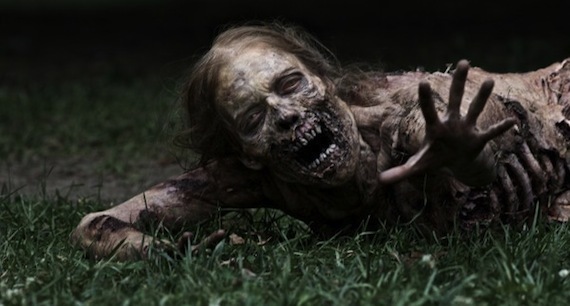 Zombies’ food supply would eventually run out and they’d just starve to death. In other words: Buh-bye human race! Death is already an idea most of us aren’t comfortable discussing. It’s the usual things: the lack of control, what the afterlife has in store, the possibility that there is no afterlife. Extinction is far worse. It confirms our vulnerability as a species. It’s death with no legacy. It’s as if we were never there, which invites us to wonder if it even mattered that we were. This, of course, suggests that we believe we matter only if we are. Meaninglessness is something people have never been very good at reconciling. Nihilism comes close, but it’s just no fun. And that’s the problem. Maybe life means nothing at all, but that’s hardly a reason to not have fun doing it. If anything, it’s an incentive to have a massive party. So while people are hosting Walking Dead parties, I’m still working up the courage to watch the pilot. Some of you might egg me on, telling me to face my fear. And sometimes, facing fears can be fun. But I understand this phobia. I think I’ve been working it out in this post pretty efficiently. What scares me now is the prospect that having figured out the wherefore of this thing won’t prevent me from having more zombie dreams. Believe me. They’re no fun. That happens to me too! Whenever I see zombie movies they reliably show up in my dreams that week. Usually the dream is about something else entirely, then I hear there are zombies coming, or I see one, and suddenly the rules of the dream change… Also they’re the violent, fast, 28-days-later kind of zombie. So in the dream, I have to drop whatever I was doing, baking a pie or whatever, and hide out, locking doors and windows. I spend the dreams terrified that a friend or family member will be caught outside and be bitten, and then I’ll have to lock them out with the zombie masses, or just that I’ll be spotted by a zombie. Besides “staring death in the face”, one of the worst events in the zombie genre is when the protagonist has to watch as a fellow survivor, possibly the last remaining loved one, becomes a zombie and you can’t even deal with the loss, because you have to lock them in a room or kill them. (Danny Boyle used that subplot in both of his zombie movies)… I agree, these dreams are no fun. The only zombie I kind of like is Zombie Bill Nighy from Shawn of the Dead, but mostly I won’t watch. 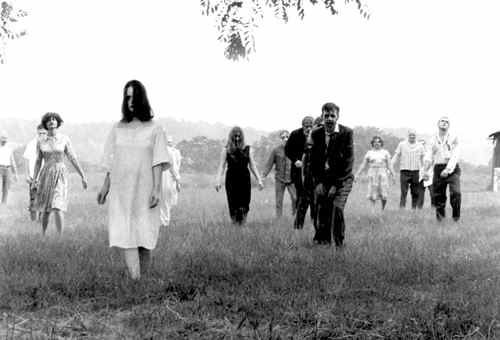 Zombies have become so kitsch lately, it’s easy to forget why they were originally terrifying. Stuff like Highschool of the Dead turns them into B-movie monsters, suitable only for mass slaughter by our action-movie heroes. Where is the terror in faceless minions who are easily mowed down by machine gun fire? That’s why I think Star Trek: First Contact is the best zombie movie ever made. It reminds us… that’s not just some faceless monster. That used to be my friend, my brother, my wife. Livvy Jams: I really enjoyed “They Came Back,” a lovely French movie about dead people who return to their loved ones. It wasn’t a zombie movie since the dead weren’t rotted or decomposed or ravenous, but it dealt with the issues of having your loved ones come back from the grave. Mostly it was about grieving and letting go. A great film. You’ve hit the nail on the head with your assessment of Zombie-Movies as perfect death allegories. In some ways, I disagree with your opinion that they entirely lack characterization. In most cases, it’s within the storyteller’s agenda that zombies lack characterization, of course, because they’re this kind of animated non-being. In Shaun of the Dead, the film even treats this very issue as an actress among the group of survivors tries to get them into “Zombie-Character” so they can slip by the horde undetected. It’s a funny moment of insight. The character’s assessment of the Zombie-Character is hilarious, but spot-on: “It’s vacant, with a hint of sadness… like a drunk who’s lost a bet.” Edgar Wright is playing with this notion, I think. Still, in perhaps my favourite Zombie-Movie (not a real one by purist Zombie-Standards), 28 Days Later, a little more work goes into crafting the “zombies” into an active allegory for cataclysmic human Antagonism rather than simple Inevitability as expressed in Mortality. They receive a kind of collective, and specifically malevolent character. You definitely don’t want to watch this one though, because it’s probably the friggin’ scariest Zombie-Movie of all time! But you’re right, none of these films have true characterization in the strictest sense. You kind of need thinking individuals to have characterization, I suppose. All this leads me to think that Zombie-Film might just be the characteristic allegorical vehicle of our cinematic generation, ultimately nihilistic and consumerist (in the macabre, literal sense), with violent feelings of the oppressive population and simultaneous alienation of urban society, all set against anxieties about oncoming death. But, as with allegory throughout the ages, characterization does get left by the wayside in favour of overall structure and message. In any case, I really liked your interpretation. I hope you can get over your fear of the genre. Maybe you should try a zombie-walk! Livvy Jams: Nice thoughts on the characterization bit, though I’d argue that it doesn’t count because Shaun of the Dead is a parody, and characterization involves at least a minimum of a personality and not just physical attributes. And certain allegories require characterizations to work. I think it just depends on the model and the storyteller. Anyhoot, all told, I doubt I’ll be facing my fear any time soon. I’ve avoided the zombie dreams. How? By simply not watching zombie movies. Zombies creep me out more than any other paranormal phenomenon you could name. And I think you’ve pretty much hit the nail on the head as to why, though I don’t believe I’ve ever thought of it in the terms you present here. I’ve just been all, “No, thanks!” to anything zombie… Uh-oh, hang on a sec… I just remembered that I read the first volume of Marvel Zombies, because I was oddly curious. It was one of the most disturbing things I’ve ever read. It was supposed to be funny, but it just left me feeling really unsettled and generally icky. Anyway, thanks for articulating this kind of undulating, wormy feeling I get when I think of zombies. Separated at birth were we? Couldn’t finish “Zombieland” either. In dreams am also concerned people are zombifying.